Monopoly is Business at the end of its journey. Comments on: "Henry Demarest Lloyd Quotes: Monopoly is Business at the end of its journey." 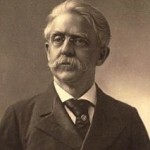 Henry Demarest Lloyd was a 19th-century American progressive political activist and pioneer muckraking journalist. He is best remembered for his exposés of the Standard Oil Company, which were written before Ida M. Tarbell's series for McClure's Magazine.